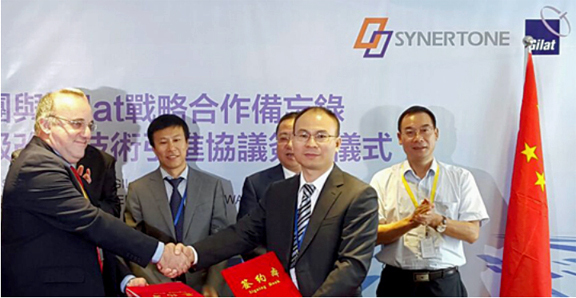 [Satnews] Gilat Satellite Networks Ltd. (NASDAQ, TASE: GILT) announces that Synertone, a Hong Kong satellite solutions provider, has selected Gilat's baseband equipment to enable fixed and mobility applications on its HTS IPSTAR-based network, offering coverage throughout China—Synertone placed orders totaling approximately $12 million for Gilat's solutions. Powering Synertone's network will be Gilat's SkyEdge II-c platform with X-Architecture. The VSATs used are part of Gilat's Capricorn suite of ultra-high-speed IP routers. The network is estimated to go live within six to 12 months. Additionally, the MOU signed by Synertone and Gilat includes an option for advanced manufacturing and future R&D cooperation, should they agree to do so.